With products like Square and Google Wallet, the ability to pay for real-world items using virtual financial institutions is rapidly becoming the most common form of commerce. However, Jonathan Stark, a mobile application consultant, has a new take on this concept of Internet-fueled trade, and he has brought it to the next level. As noted by one of his blog posts, he believes that anyone can broadcast mobile currency for wide individual usage. 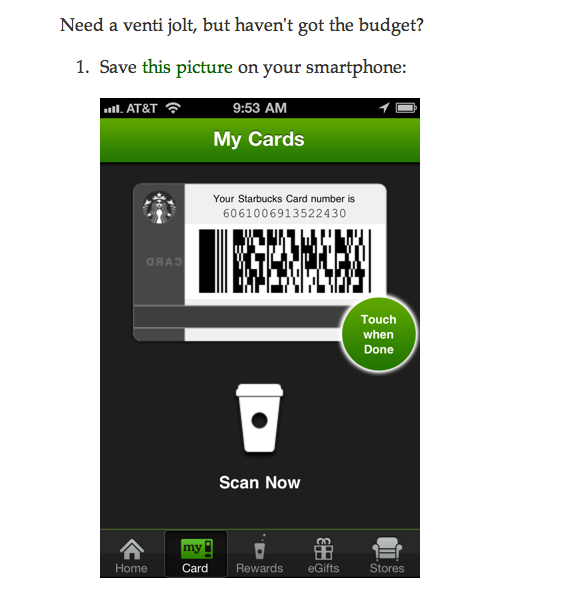 As an experiment, Stark has published an image of a Starbucks card on the Internet so that people can purchase coffee using it, and whenever they happen to have money, they can put it back on the card. It’s like a village well of espresso, and anyone can drink from it. The premise of Jonathan’s Card is fairly simple. 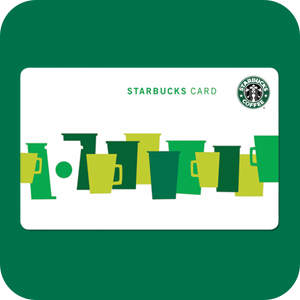 If you’re short on cash and need a caffeine kick, just use an image of the card to purchase a cup of coffee at Starbucks. The question is this though – how does it work? Stark has published a digital image of the card on his personal website, so all you have to do is download the image to your smartphone, go into your local Starbucks, scan your phone into the barcode reader, and after that, voilá – free coffee. As stated by the creator himself, the whole concept is very similar to Italy’s “caffé pagato” custom or the trend of “take a penny, leave a penny” in US convenience stores. As an app developer, Stark has implemented scripts to check in on the financial status of the card every fifteen minutes. After checking, the script then publishes the status of the card on its Twitter account. The scripted messages simply state how much money is in the account, warn users if the account is getting low, and request money if there isn’t any available at all. On his blog, Stark requests that you limit yourself to drinks that are around $3.00, but as we all know with Starbucks, that might be problematic. For instance, it might be best to grab a tall rather than a venti on your Stark-sponsored visit. He also asks that you publish a picture of you and your drink to Twitter, and after that, Stark himself (presumably not the bot) will give you a shout-out tweet. As you may have gathered, Jonathan’s Card could be fairly exploitable if put in the wrong hands. Just because anyone can put money on the card doesn’t mean anyone actually has do it. Everyone can use the card to purchase a drink anonymously, so there really is no way to have an accountability system, and this could prove to be difficult. Based on one of the card’s tweets, someone once cleaned out the card’s account without even as little as a Twitter picture to contribute – bummer. By all appearances, Stark does his part by occasionally putting money on the card himself and donating coffee to the community. Also, with only about 300 legitimate followers, it can be hard to have a constant flow of money making it to the card. That being said, it is very important for the Jonathan’s Card community to donate money to keep it alive. 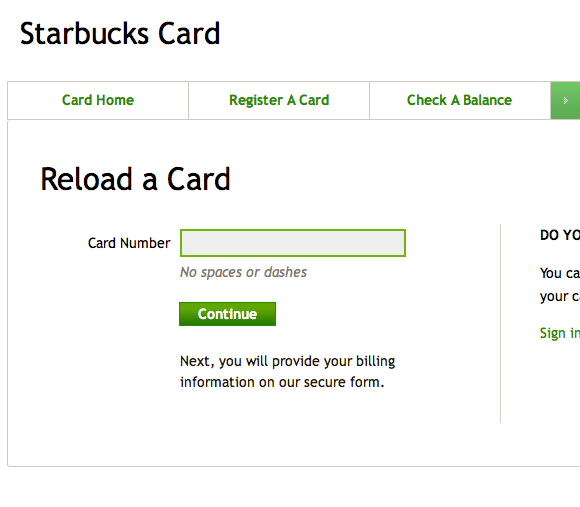 Basically, if you are feeling generous, just head over to the Starbucks website, click where it says “reload a card”, punch in the card number (6061006913522430), and you’ll do a favor for the rest of society by giving whatever you think is a good amount. 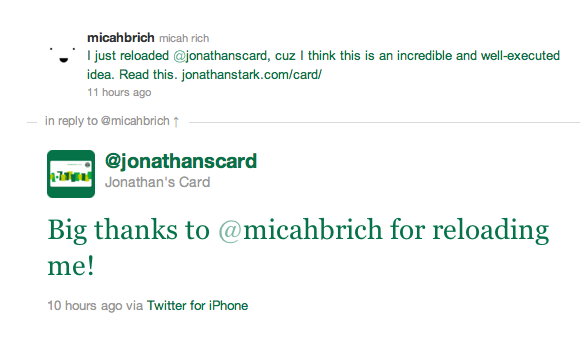 Furthermore, if you do reload the card, you can tweet Jonathan, and this will merit another shout-out. Else, you could always remain anonymous and enjoy the fact that someone out there is sipping a delicious drink that you helped provide. 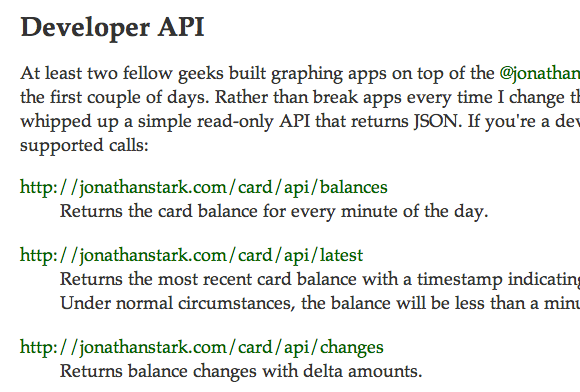 Furthermore, if you wish to contribute and happen to an app developer, you can check out the API that Stark provides on the card’s website. Although he has not yet produced an app for the sharing system, there is definitely room for it. Since it is a community project, you could likely help him out by submitting him your ideas or works-in-progress. 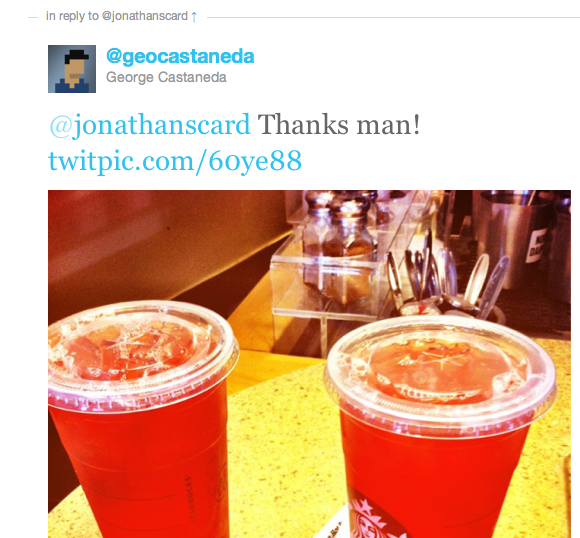 The concept of Jonathan’s Card is very similar to Pepsi’s futuristic social vending system in which users can purchase drinks for another person who enters a code that is delivered to his or her mobile phone, and based on these two currency broadcasting systems alone, it is highly possible that our world will be seeing a new trend in this social sharing method. Being a writer, I’ll admit that coffee certainly helps me out whenever it is on hand, and Jonathan’s Card is something that I could make use of. 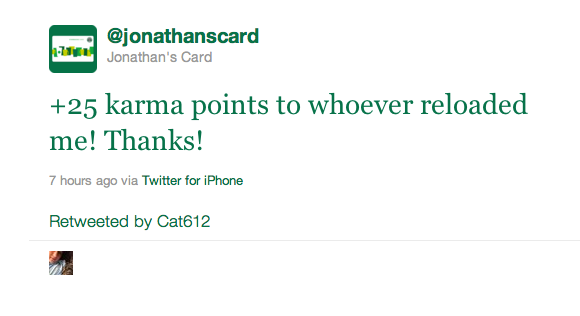 As a final note, you can embrace the magic of the card by following @JonathansCard on Twitter. 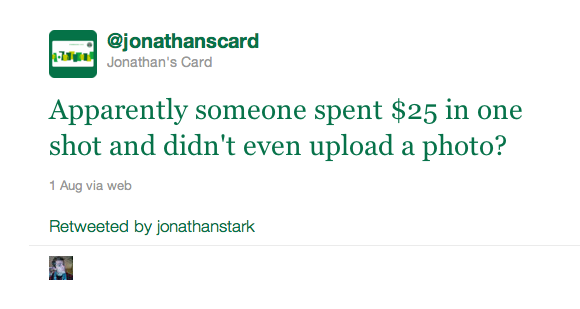 Have you been able to use Jonathan’s Card? What other similar social sharing systems (even if they are locally based) have you been able to use? 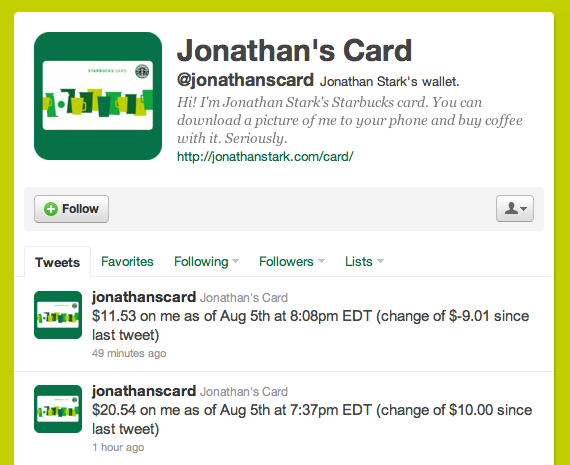 Have you tried using Jonathan’s Card with a hard-copy image or even just the code?